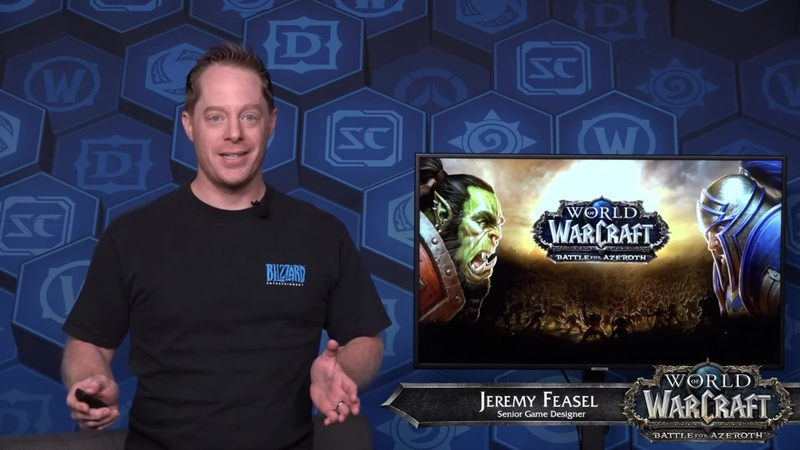 On April 11, game designer Jeremy Feasel conducted a 30-minute livestream to showcase a comprehensive 8.2 Rise of Azshara content preview. Hi, everybody. My name is Jeremy Feasel. 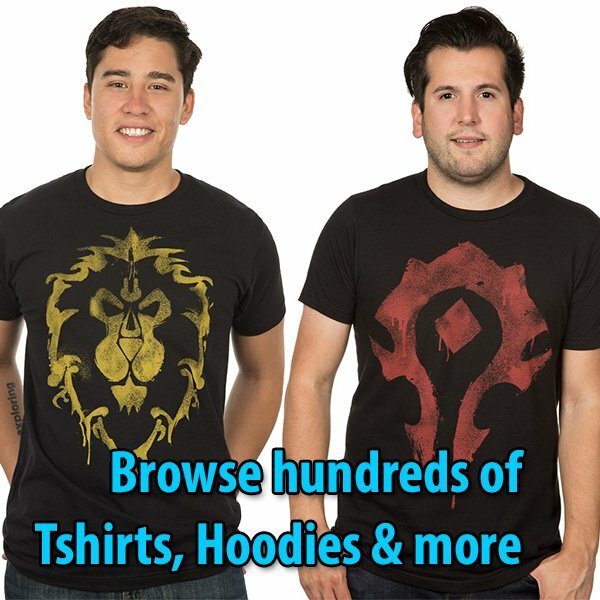 I am a game designer on the World of Warcraft team; and welcome to our livestream for Rise of Azshara. We are working really hard on a lot of content. Recently, we unleashed Tides of Vengeance; and we unleashed Patch 8.1.5. Tons of content there. Increased toward the story of that line: we fought the Battle of Dazar’alor, and we got the Kul Tirans and the Zandalari on our side; but not it is finally the time when we get to talk to you a little bit about our next large content update — that we have only given you glimpses of back at BlizzCon. So… super-excited to get into everything. Let’s go ahead and jump right in, and start talking about Rise of Azshara. Just to set the stage for you really quickly and catch you up on the storyline, we defeated the Battle for Dazar’alor, King Rastakhan fell, Mekkatorque is on ice, and everybody retreated. After that, we got the Kul Tirans and the Zandalari as our allies, and their last remaining ships; and just recently, just this week, you picked up a brand-new nice friend and unlocked the ability to see what was underneath the Shrine of the Storm in the Crucible of Storms. 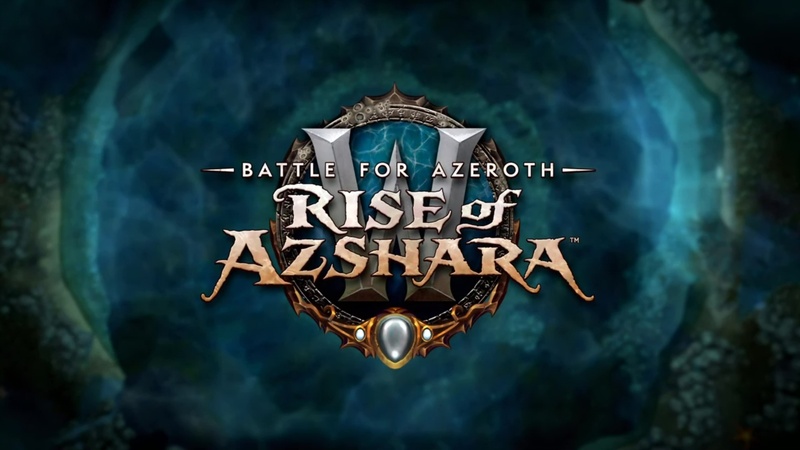 Now, of course, next week many of our bravest champions are going to take the fight down there; and the consequences of that are what are going to ultimately launch Rise of Azshara. So where are we at at the story? Well… Sylvanas has learned something; and we are not going quite into what that is; but what ends up happening is she sends some of her most powerful champions: Lor’Themar and Nathanos out on her flagship, and with some of the few remaining ships out to sea. The Alliance sees this, and immediately seizes the opportunity and begins chasing her forces. Jaina, at the helm of her own flagship; and it is at this time, that our third warbringer finally plays her cards. The seas will open up beneath us, and our ships fall and shatter on the rocks below; and we find ourselves in this strange new land that has recently seen air for the first time in tens of thousands of years with Nazjatar. But we will get into all that in a second. First, let’s take a look at the high-level rundown of everything coming at you in Rise of Azshara. We have got two brand-new zones: including the formerly-underwater zone of Nazjatar, and rust-technological island of Mechagon. 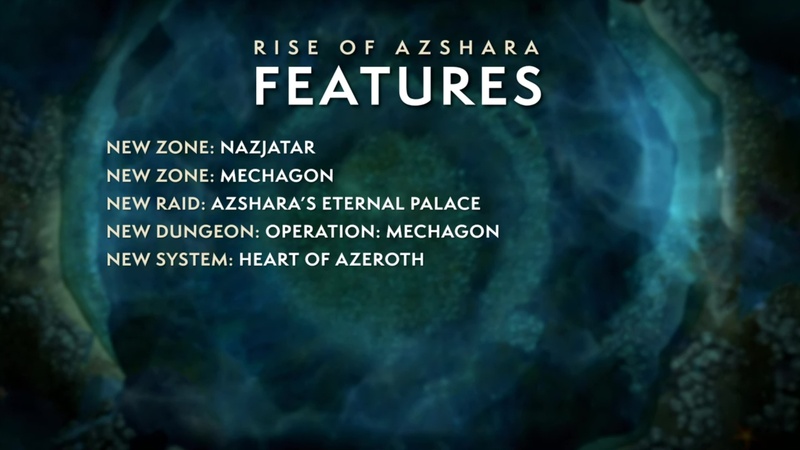 We are going to be raiding Azshara’s Eternal Palace, and having a confrontation with Queen Azshara herself. We are also going to be heading in to the city of Mechagon, on Operation: Mechagon — A mega-dungeon with 8 bosses. We will also have a brand-new system with the Heart of Azeroth, that we are going to be talking a lot about today. 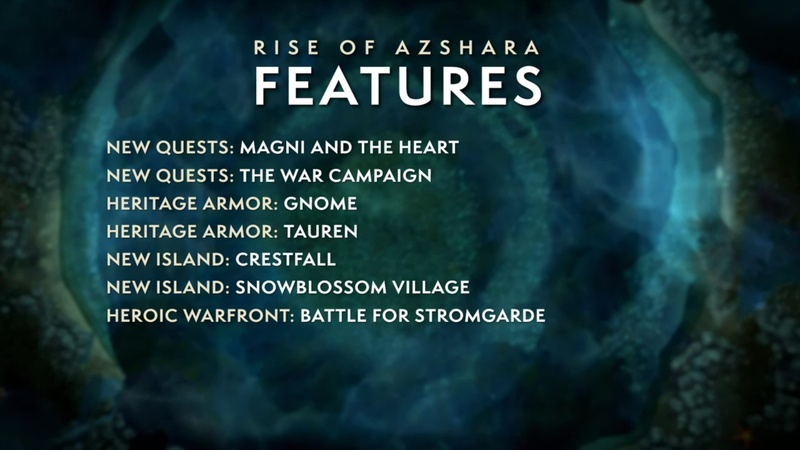 In addition, Rise of Azshara has a host of additional features which include: new quests spanning Magni and the War Campaign that spans all across Azeroth and contain a wild variety of different locals, people to meet, and things to interact with. We have got two Heritate Armor questlines for the Gnomes and the Tauren; as well as two brand-new islands with Crestfall and Snowblossom Village; and we will be experimenting with Heroic Warfronts starting with Battle for Stromgarde. But that’s not all! We have also got a variety of other features that hit up just about every player type in the playerbase. 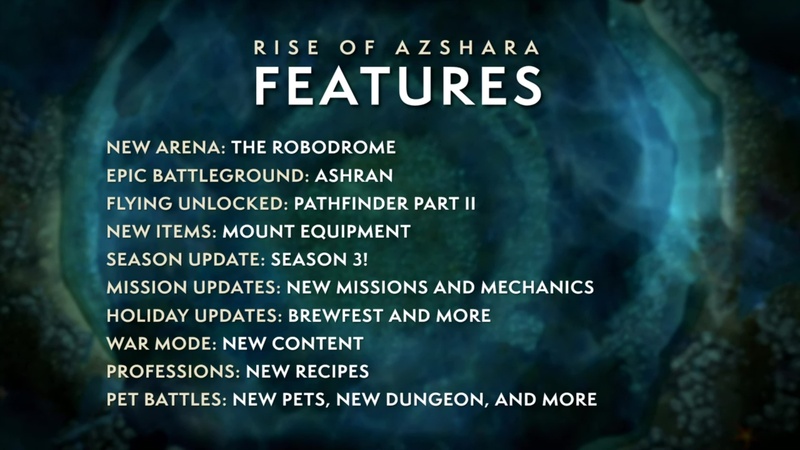 For PvP players, we have got a new Arena with the Robodrome; and Ashran is returning as an epic battleground. For everybody, you unlock flying with Pathfinder Part 2, and we are going to be talking about new items called Mount Equipment. Season 3 is coming with its item level increases, and we will have mission updates with new missions and mechanics. Of course, Holiday updates including a revamp to Brewfest, some War Mode specific content, brand-new professions content, and new Pet Battles content. There are a lot of things coming in Rise of Azshara.